Newly formed and trained police patrols will start working in Kyiv as of July 4, 2015. 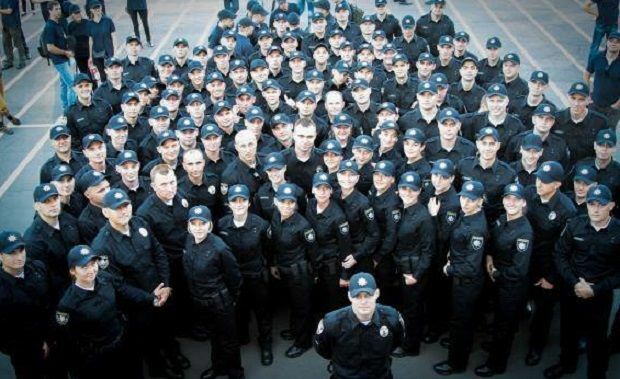 A brand new Kyiv "patrol police" service has been formed from 1,916 young police officers, according to Ukrainian Interior Minister Arsen Avakov. In mid-August, a similar patrol police service will be introduced in Odesa. Lviv and Kharkiv are the next on the list. A general meeting of the new police took place at the National Academy of Internal Affairs in Kyiv on June 12, to introduce Chief of the Patrol Service Department Oleh Savchyn and Chief of the patrol service of Kyiv Oleksandr Fatsevych to the police officers, who will patrol Kyiv streets, the minister wrote. The minister described the new personnel as "handsome, young, self-motivated." "The guys already demonstrate their responsibility and at the same time they are incredibly optimistic," Avakov wrote, adding that he and his first deputy Eka Zguladze are satisfied with the accomplished first stage of their work. Posted by Юлія Бабич on 12 Июнь 2015 г. Similar patrol police will also start working in Odesa soon. Newly appointed Odesa governor Mikheil Saakashvili announced at a strategic congress of Odesa region on June 14 that police patrols would start patrolling Odesa streets as of the middle of August. Their new chief will be introduced on June 16. The reform to create police instead of the current Ukrainian militia was announced by Zguladze on December 25, 2014. The first stage of the reform includes the reformation of the patrol service. According to Zguladze, about 11,000 applicants submitted their documents to new police schools in the first two days late in January 2015. Women accounted for more than 30% of the applicants.